One cage, two dogs and five days of hope—all in just 60-minutes. 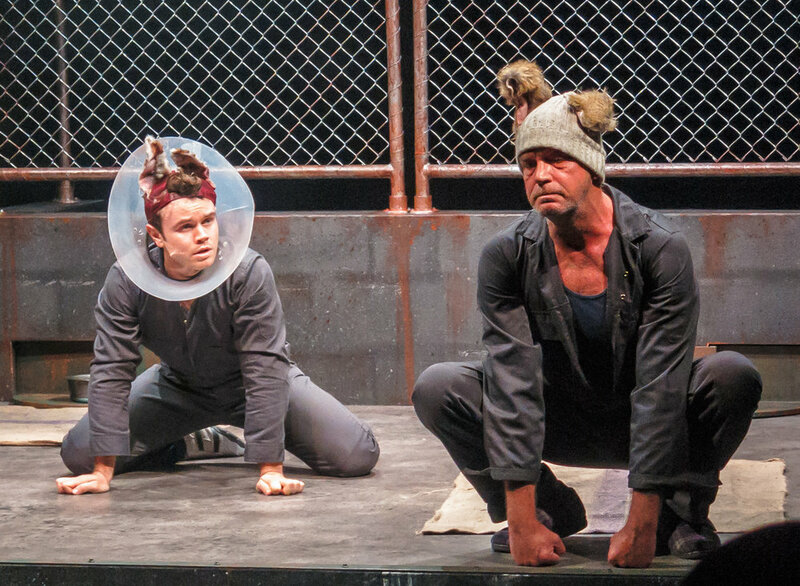 A Coupla Dogs interweaves many adages about ‘man’s best friend’ in a tightly-written play (co-written by Sue Rider with Director, Andrew Cory). Dogs are in rescue kennels for a variety of reasons: the abandoned ‘Christmas dog,’ unwanted litters, victims of cruelty, or those surrendered on the death of their owner. A Coupla Dogs presents life from the dog’s perspective. Or rather, that of the two dogs who share a cage at Beryl’s Kennels—receiving second-rate care while they wait for rescue or the inevitable ‘backroom’ death. Humans only appear as disembodied voices, mainly over the crackly holiday-camp-style speaker system (Beryl, voiced by Barb Lowing, with Fred and others performed by Andrew Cory, Noah Cory, Sue Rider, and Peter Crees). Pictured (L to R): Compelling performances by Tom Oliver (Young Dog) and Ron Kelly (Old Dog). Picture credit: Creative Futures Photography. But this isn’t merely a tale (or even two tails) about the ways in which ‘man’s best friend’ is abandoned, imprisoned and even re-programed. Or how society treats its most vulnerable. It is also an opportunity to delve into some of the deeper philosophical questions of life. In the words of Young Dog (Tom Oliver), ‘what am I doing here?’ Compassion, fear, love, desire, hope and mortality wrapped up in thinking about the meaning of life. Think Animal Farm (George Orwell) meets Rosencrantz and Guildenstern Are Dead (Tom Stoppard) and Waiting for Godot (Samuel Beckett). Two animal characters, dependent on powerful controlling outside forces, waiting to be ‘rescued’ and filling their time with discussions of philosophy, life and survival. Don’t let me give you the impression it’s all gloom and doom. There are some very funny moments in this production—from the stage business (that squeaky tog, the tail-wagging, and those outfits) to the news-reporting/distortions by the ‘Channel Four’ reporter (“sponsored by Hard Force Dog Catchers”). And at the end we have a glimmer of hope…or is it just a flame for the moth to die in? Pictured (L to R): Ron Kelly (Old Dog) and Tom Oliver (Young Dog). Picture credit: Creative Futures Photography. 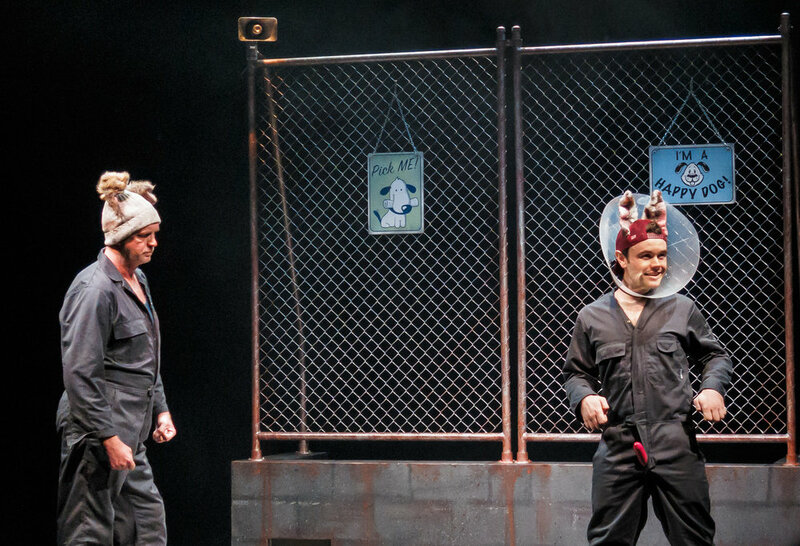 Pictured (L to R): Ron Kelly (Old Dog) and Tom Oliver (Young Dog) in chains. Picture credit: Creative Futures Photography. Dog Spoon Theatre has assembled a strong team for this world premiere, and I hope that it tours to festivals large and small. Great casting and absolutely compelling performances by Ron Kelly (Old Dog) and Tom Oliver (Young Dog). Fabulous Production Design (Josh McIntosh), lighting (Jason Glenwright), and Sound Design (Peter Crees, with intern Isabella Hall). And a well-written and directed new play. See it if you can. Verdict: Great to see new, local work in the 2018 Brisbane Festival. See it while you can. Audience tip: Go—but make it an evening for friends rather than younger members of the family. Book a babysitter so you can relax and enjoy the show (suitable for 16+, with adult themes, sexual references, and coarse language). Tickets $24 - $32 (25-28 September 2018 at 7:15pm, and 29 September at 4:30pm). A Coupla Dogs is at The Block, located in Theatre Republic, QUT Kelvin Grove. Make sure you spend some time in Theatre Republic to visit the various free ‘activations’ (including the book exchange and seed library) and enjoy the occasional free music performances. For more information on other Brisbane Festival events, check out the Brisbane Festival website. The reviewer attended the Tuesday 25th September 2018 performance (7:15pm).